In 1994, he successfully entered the Parliament of St.Vincent and the Grenadines as the Area Representative for North Central Windward (a seat he holds to this day), approximately 15 years after he first contested the General Elections. He is the fifth longest serving Parliamentarian here. Former Prime Minister Sir James Mitchell holds the record as the longest serving Parliamentarian in St.Vincent and the Grenadines with 34 years; followed by Ebenezer Theodore Joshua, 28 years; Sir Vincent Beache, 26 years; and former Prime Minister Robert Milton Cato, 23 years, respectively. 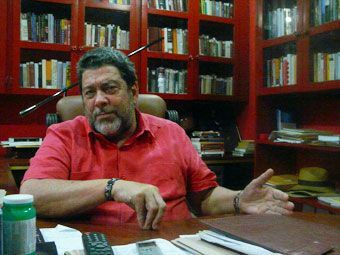 Gonsalves, on Sunday, February 20, sat and reflected on his 17th anniversary as an MP with SEARCHLIGHT Midweekâs editor, Hawkins Nanton. This is an edited version of the interview. Question: People consider 15th and 20th anniversaries as significant. What is special about your 17th anniversary as a Member of Parliament? Answer: It is the first anniversary of my election as a MP which has arisen in my third term as a Government. The second reason also, I am now the longest serving sitting member in the House. Sir Louis Straker and I entered Parliament on the same day. We were elected on February 21, 1994, on the joint Labour-MNU unity ticket. Sir Louis didnât contest the last general elections, therefore I remain the longest serving member. I would also probably think I am the longest serving member in North Central Windward. Question: Can you compare how it was when you entered Parliament to the politics of today? Answer: I think the politics of today has one distinguishing feature, that there is more personal vilification now than then. People used to be criticising other persons, but it was more in the line of political picong. You didnât have the sense of hatred generated, which I find there is now. Persons who were then in Opposition, they fought to get in; they never manufactured stories as we find happening now with the Opposition in St.Vincent and the Grenadines and being so extremely bitter, which bitterness amounts to hatred really. Many, many of the Opposition personalities engage in this campaign of personal vilification to an extent to which that was not the case when I got in. Another difference is that you didnât have the media as intrusive then as it is now: you have talk shows 24 hours a day. In those days, you only had one radio station, the state owned radio station, and the Mitchell administration controlled it very tightly. And then in 1994, we didnât have the Internet. Question: Some things have changed in Parliament over the years, but there are many areas for possible improvement. What proposal would you put forward to reform Parliament so that Parliamentarians can get the most of it? Answer: There were some very important provisions in the new draft Constitution which was rejected: to reform Parliament, strengthening the Minority Leader, that is to say the Leader of the Opposition, strengthening the power of the Public Accounts Committee, making sure that we had not just First Past the Post Representation, but also Proportional Representation to have a fairer system of Representation than we have now. Short of all of those important structural developments we have done several things. Weâve had Parliament broadcast live, make Parliament meet regularly. It used to meet with real infrequency. We have used very frequently the Select Committee system to ensure wider participation. We have publicised the bills which we are going to debate in Parliament; all those are designed to make the system more transparent and open. We can still do some other kinds of reforms. Like for instance, in the Constitution [draft], we had the issue of an Integrity Commission for Parliamentarians and Senior Public Officers and Police Officers. That was rejected in the Referendum, along with some other very progressive ideas and institutions. We can still proceed to do Integrity Legislation, just that it would not be entrenched in the Constitution. Question: What capacity building programmes would you suggest be introduced to help Parliamentarians better understand their roles in domesticating, international, regional and sub-regional instruments and affairs? Answer: We are supposed to use very much the Commonwealth Parliamentary Association Local Branch, but because of the way the Opposition is behaving, they are not interested in having many meetings of the CPA. The Speaker is the President of the CPA Local Branch and the Leader of the Opposition and I are Vice-Presidents in that Body. Because the CPA is not meeting, one of the things which we today [Sunday, February 20] decided at our retreat [at Orange Hill] for our Party, is that we are going to launch a political academy, with a view to train and educate Vincentians, including Parliamentarians and other Party activists and interested persons, on a range of issues. These issues will touch on Parliament, the Constitution, Public Policy, Electioneering, the whole gamut of issues in the realm, which touch and concern political matters. Question: Leader of the Opposition Arnhim Eustace has expressed dissatisfaction with the time given to his team to review the Estimates for the National Budget. Are there plans to address this concern? Answer: The Opposition Leader, his view as to the lateness of presentation of Estimates is just whining. Itâs just child-like complaints. When I went to Parliament first, I used to get the Estimates and the Budget Speech after the Prime Minister delivers his Budget Speech on the night. They were turned in a rolled up fashion at one time. I used to get them the night and we had to reply the next morning. He would get the Estimates three, four days, before the Estimates debate and at least one week before the Budget debate. So he canât really seriously complain about those time lines, given what used to happen under the NDP. It is true that on this occasion, we were about a day or two shorter than we would normally give, but that was because of the fact that the Budget was in January after the elections and we wanted to bring everything by the third week in January. The Leader of the Opposition, itâs his tendency to whine and complain about everything. Question: On the sensitive area of HIV/AIDS, we are seeing repeat pregnancies by women who have the virus. Also, there are other reports where it is said that people infected with HIV spread the virus intentionally. Are there any plans to pass legislation to address these sensitive issues? Answer: There are no immediate plans, but I know being discussed in the system is that we shouldnât just leave these matters voluntarily. That we should put some sanctions in circumstances where people with HIV and AIDS act recklessly. Of course, you want to not have persons with HIV and AIDS stigmatized and it is important that they are not stigmatized. So there are some complicated questions which arise, which require a lot of serious policy study to come to conclusions as to whether you should do something further on the legal front. Question: As we end, what would you pinpoint as your most memorable experience in Parliament? Answer: I would say the day when we passed the bill with the two thirds majority, the Constitution Amendment Bill, where we wanted to go forward to the people with a new constitution. When it was passed in the House to go forward to the Referendum, I think that was a very good moment.